* All of the theme chains (excepting Hard Rock at the Falls). I know Buffalonians will take issue with me on these words. "We don't need dose chains der -- we've got da Bocce Club's, dat LaNova's der, da Polish Villa's, da MIghty Taco's, and da great Italian restaurants on every corner der." Perhaps, and the funky restaurants of the Elmwood Village/Delaware District area too, but consider what Buffalo doesn't have. Yes, there's independent Italian and Greek restaurants everywhere, as well as those "bar-in-the-front-little-restaurant-in-the-back-with-bowling-trophies-in-all-the-windows" joints. Buffalo has GREAT restaurants, but the variety isn't there compared to other -- it's spaghetti, souvlaki, or a goot fishfry der at a bar der on da Unionroat der. My major point, though, is that it's telling -- very telling -- that so few upscale retail and restaurant chains have considered a location in Buffalo. Milwaukee suffers from a lack of upscalers too (I count 6 from your list that are here), but then again we will forever be in Chicago's shadow. It's a quick train ride or an hour by car from my door to Union Station and the spendor of Miracle Mile. It doesn't help the image when our airport bills itself as "Chicago's Third Airport". It does alot for the image, ya know? I did a search on Restoration Hardware locations and found they cut a wide zone around Cleveland, from Pittsburg to Columbus to Troy, MI and two in Toronto. I'm sure it's the same for IKEA and most others of that ilk. The truly chic come here to find chrome dinettes, bowling bags and other "shabby" home decor items. Speaking of Toronto, while visiting there I noticed a clothing store to add to the brand awareness list: French Connection UK. There logo shirts (a la DKNY) are quite striking. Add Whole Foods markets to your retail economic indicators. They have moved to the outskirts of Cleveland after opening stores in almost every state surrounding Ohio. Only West Virginia is more avoided. No Whole Foods in Buffalo. Check. ...is the Cheesecake Factory so good you had to list it twice? I haven't even heard of most of the ones on the list. Toronto has two FCUK outlets. And a Whole Foods Market. I didn't know we had Restoration Hardware though, never heard of them. I hadn't heard of most of the restaurant chains Dan listed. We have three...three! IKEAs ah ah ah ah (sorry - bad Count impression). This begs the question of economic indicators versus regional identity. Sure, Buffalo ( and Cleveland) may not have the propensity to spend spend spend some areas do -- but NH? Isn't there a tendency for parts of New England to oppose the big boxes in favor of local character? Wouldn't that lead to some of these chains not recognizing the market exists? Better still, doesn't that leave room for local retailers, restaurants, etc. to make a good living from the economic prosperity of the region? Cleveland at least has some outstanding boutique businesses filling the niches the upscale chains might occupy. They're just not as easy to find. I'd be happier if some of the national grocery, retail and drugstore chains would have passed us by. Too much real estate was lost to competition only to be vacated in the eventual shake out. The chains are slowly making their way here, though, yes, may parts of New England are staunchly opposed to big box development. Home De(s)pot - established firmly, expanding all over the place. Target - just starting to move into New England. There's one that's been around for 2 years in my hometown, and more are coming. Longhorn - I've only seen one, and it's in my hometown. Buffalo didn't really have ANY chain stores from out of town until the 70's and 80's. It seems that we don't want them as much as other places. I agree that if we were a thriving metropolis those chains would want to come here, and that it could eb an economic indicator. I don't like your language jokes, I think Buffalo is losing its identity as a Bowling town. I don't get to the southern suburbs much, but the northern suburbs and most of the city have completly lost that. Lackawana and its southern neighbors may forever be bowling steelworkers, but its surely isn't the majority of the region. That's the end of my complaint, but give Buffalo 50 yrs, when we are all dead and decaying Buffalo will be great again. That's the irony of life. Milwaukee is getting a PF Chang's later this summer. I'm not holding out a lot of hope for their over-priced food. Right now we pretty much only have authentic (i.e. really cheap) Chinese food options, like from "King's Panda Dragon Happy Monkey #3". I think Buffalo is losing its identity as a Bowling town. Scene from Buffalo 66. Something I can closely relate to, having been born in Buffalo in 1966.
give Buffalo 50 yrs, when we are all dead and decaying Buffalo will be great again. That's the irony of life. I hope. Hell, I hope it comes sooner than that. Haha, but I hope it does too, good old Tony (mayor) doesn't seem to be much, the way I figure it is if we just steal lots of money from nyc the way the have leeched off us we'd be fine, oh well. Such is life, paying other peoples taxes. At the other end of the scale, what does it say about a community that is dominated by dollar stores, bargain giants, frenchy's, zellers, and used building supply stores? I think you will have to explain Frenchy's to this crowd!! I wrote a little about it in the bran appeal thread...sorry I don't know how to post a link to my entry. I think it means you're probably a hoser, eh? You beat me to it Tranplanner! "All the bowling alleys had been wrecked....there wasn't much to do...so's I spent most my time looking for beer..."
Are there such places in Canada? Is there a Canadian equivalent to my "town next door?" Sitting here, in my kenora dinner jacket, kodiak work boots and reminiscing for a 50 from a stubbie (I know B+D drank canadian, but I prefer ales). I think I'll have to go to the zehrs and buy some back bacon for lunch. if I'm lucky the coleman stove will light first try. as long as red cap tastes better then Brick's red baron and formosa springs draft. Red Cap is alright, nothing special - it was actually brewed by O'Keefe, waaaaaaaaaaaaay back when. Brick bought the rights and repackaged it. I would think that anything would taste good after a 50...yeech! I see Dan amended his original post (nice photos) and stressed the point that what the upscale chains do says something about Buffalo (and cities like it). I would stress that retail chains are profit skimming opportunistis with no real motivation to understand the quirks of local markets (Red Lobster in New England indeed). "This week is the 45th International Council of Shopping Centers (ICSC) Conference and Exhibition in Las Vegas ... Solution providers ... are representing the modeling and site selection contingent of the GIS world. "But all is not well in the retail modeling world ... as Bryan Gross of MPSI points out, "I perceive the number one pitfall in retail modeling to be the misuse and misunderstanding of methods versus reality. As an example, the religious use of market share, origin-destination models in environments that are transient and dynamic in nature may provide a sound classical approach, but lacks realism." In other words, they need to get their faces away from their monitors and go out and visit real locations. Until site selection looks real world conditions I wouldn't look to them for validation. Is this part of that Geographic Undesirability theory? Most of Dan/s are in Wanna Be townhouse communities in my neck of the woods. Out of all you mentioned Williamsville only has the Mercedes Dealer, yes they are all wealthy, but their business district is small and unfriendly, they are trying to wider Main st. again. Rock on 10 lane Main St. Its 6 now, I think? Either way I think this post was meant more at major cities, and not small rich suburbs that surround them. Yodan is right ... the barrier to more upscale retail in Williamsville is Main Street -- fast, wide and busy. Elmwood Avenue in Buffalo is a great retail street. One lane of traffic in each direction for three miles, on-street parking and a bit of congestion. Congestion lends to the vibrant feel, but since it's not six or eight lanes wide, it doesn't seem threatening or overwhelming. Mercedes dealers? Las Cruces, New Mexico has one -- and they're in the not-so-rich Borderlands region. As far as auto sales goes, I find the areas just outside very affluent towns and neighborhoods often have used car dealers specializing in more esoteric brands -- some guy who sells nothing but old Citroens, Ferraris, Alfa Romeos, or Puegeots, for instance. Update from Cleveland ... there's a restaurant chain that is EVERYWHERE in the United States -- even in Buffalo -- but not here in Cleveland area. Wanna' know what it is? That's right. Cleveland has California Pizza Kitchen, P.F. 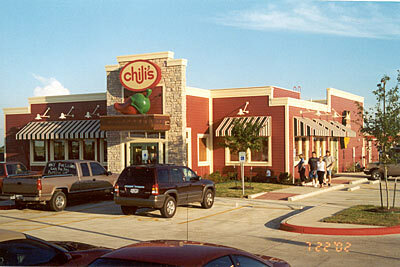 Chang's, Brio, Falling Rock, Claddagh, Cheesecake Factory, and a bunch of other upscale chains ... but not lowly Chili's. Okay ... I think there's one in a distant exurb, but that's it; kinda' like Starbucks in Toledo. Family Dollar and Rent-A-Center are ubiquitous in "downscale" cities, those places most unlikely to succeed with specialty niche retail. Cheesecake Factory, Ben & Jerry's - whatever. When you're looking for a good tattoo come to our downtown. Upstate NY is slowly getting the chain restaurants. Vestal outside of Binghamton just landed a Texas Roadhouse to go with its many other chains. Even Ithaca has finally allowed chain stores to open. Never thought I would see Best Buy, Pier I, Target and Home Depot. Wal-Mart is coming as well. Many people in here would never eat at Olive Garden or other chain Italian places when you have the real stuff from a restaurant that has existed for 80 years. When you look at the economics of an area, if population is declining, why would a chain look at an area...? Has anyone noticed too how some chains seem to be leaders in developing an area? It's as if they see, for example, a Border's opening, and think, ok, well, the market there must be ready for Barnes and Noble. Then Pottery Barn opens up, followed almost immediately by Williams Sonoma and Restoration Hardware. Still waiting for IKEA, though. Witness a rural NY state county south of you with a declining population: Wal-Mart is expanding their retail store into a supercenter, and Tractor Supply Co. is opening in a former Ames store in a declining retail plaza. Even declining poor rural areas have untapped market potential. With most of the larger retailers, it only takes a year or two of average profits to recoup development costs. Because the people that stay are the ones that likely want to expereince the big box thrill and think it will revitalize the local economy. How about this... Rochester, NY and Syracuse NY do not contain a single one of these... They are the largest drug chain in the U.S. Yes, that's Walgreens... Avoiding Rochester and Syracuse like the plague. Dan, I am assuming your list only includes the city of Buffalo? There are Bed Bath and Beyonds in Amherst and in the Galleria. I fully believe some people use these upscale retailers and restaurants to judge a region's worth. Especially with those retailers Plannerbabs mentioned, it can be a deal breaker. But on the subject of these places breaking in development, I fully believe that as well: wasn't a Borders store the first mass retailer to occupy space along Center City Philadelphia's Avenue of the Arts (Broad St.), paving the way for Tower Records, etc.? BTW, Oklahoma City has seven on the list (plus, P.F. Changs coming soon), and if I'm not mistaken Cleveland has 22. Yes, I think it's all about aggregate income and market area. Out of all you mentioned Williamsville only has the Mercedes Dealer, yes they are all wealthy, but their business district is small and unfriendly, they are trying to wider Main st. again. There's a Chico's and Talbots on Main Street in Williamsville. The first 2 Quiznos Sub outlets in NY outside of the NYC metro opened in Williamsville this week and the Atlanta Bread Company is opening up there soon as well. Quiznos is landing in Vestal, NY soon. How's the food. They are locating in a small retail center with 3 Subways within 3 miles. Great sandwiches. Buns are toasted with ingredients right on them. Aren't small either. Ingredients are fresh and the sauces kick 'em up a notch. Schlotzsky's vs. Quizno's vs. _________? Hey, that must mean Fairfield has really arrived. We will have THREEn Quiznos-including one downtown! Nobody mentioned United Colors Of Benetton? That chain is in lots of malls here, but it's prices are excesive, and I doubt I've seen anybody shopping there.. EVER. We used to have one but they left about 5 years ago. Can't say I miss them, and it was as you say no one was in there ever.